When trade union leaders and delegates meet this weekend ahead of their annual congress, staged unusually in London, much of the discussion will focus on the second stage in the battle over public sector pensions. Since the first round earlier this year, some of the anger and bitterness at government cuts has dissipated. Negotiators report that discussions entered a more nuanced phase over the summer as the Treasury minister Danny Alexander and Cabinet Office supremo Francis Mauderecognised that health service pensions are different to teachers’ pensions, which are separate again from the local government scheme. This was partly tactical on the government side, which needed to prevent five million workers from striking together, and partly a recognition of the realities of public sector pension schemes. Ministers now appear to accept that the health service has the advantage of lower average pay and a younger workforce, limiting its pension liabilities. Local government workers have a large deficit in their pension scheme, but it is partly funded by an investment pool that sets it apart from the schemes for nurses and teachers, which are paid out of workers’ contributions, and when that is not enough, Treasury coffers. A dispute of titanic proportions is still possible because Alexander and Maude appear to have made few concrete concessions. 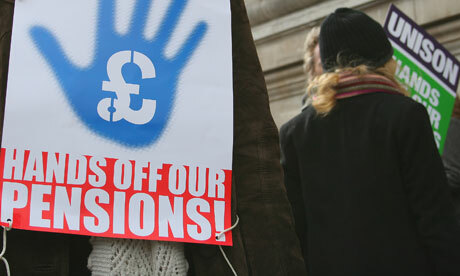 Their across-the-board attack will see all schemes suffer cuts after a planned switch from pensions based on final salary to ones based on career average salary, and a downgrading of the inflation-proofing of retirement incomes by linking them to the consumer prices index rather than the retail prices index. These two changes alone would deny workers a significant slice of their retirement income. Some calculations put the figure at 20%, others higher, as the government seeks to save billions of pounds from the public sector pensions bill. Without attempting to determine which side presents a more accurate picture of public sector pension costs, it is obvious that some big winners and losers are likely to emerge from any agreement. The first winner is anyone over the age of 55. Ministers have already conceded that all accrued rights will be respected, leaving older workers with all their final salary-linked benefits intact. A 55-year-old with 30 years’ service will lose some of his or her pension, but their accrued rights will limit the impact. Negotiations may also lead to them escaping from the government’s third major reform – a blanket move to retirement at 65. These 55-year-olds are the focus of union concern. At next week’s congress there will be talk of supporting young families, of helping them fight benefit cuts and a lack of jobs. Speeches decrying the government’s half-hearted and piecemeal proposals to boost the economy will, no doubt, be heartfelt. Yet they will have a hollow feel as the union top brass prepare to expend their intellectual and financial capital in a full-bloodied fight on behalf of their older members. Who is the government fighting for? Last year it attempted to engage in the battle as champion of the young, who it was claimed were losing out to their greedy parents and grandparents. Some ministers had excellent credentials as sponsors of this war, especially the higher education minister David Willetts, whose book The Pinch examines in fascinating detail the power of the postwar baby boomer generation. David Cameron and his benefits minister Iain Duncan Smith both defined pension benefits in generational terms as they sought to win the intellectual debate. Their own sectional interest is now obvious, if it wasn’t at the time, and it is clearly not younger people. The people who want public sector pensions cut are older workers in the private sector, who either see the rising bill for their public sector cousins in retirement as a threat to them (triggering, as it might, higher taxes) or who want the public sector to share the same pension cuts that have reduced their retirement income to a fraction of the halcyon final salary payout. So these two sides now face each other on the field of battle, as they do in some many areas of life these days, with young people by and large left unrepresented. For the Liberal Democrats it is an especially tricky area of electoral debate. Much of their policy agenda has been skewed towards richer, older people who, crucially, would pay less tax under previous plans to scrap council tax in favour of a local income tax. Away from pensions, Lib Dems will consider adopting one of the chief hopes of campaigners for intergenerational justice – a land value tax – at their conference this month, something older people with expensive properties rightly fear. It goes further than the previous mansion tax proposal because it would act as an annual charge on land wealth. Coupled with lower income taxes, especially on lower-income households, it has the potential to encourage more people to work. How Lib Dem delegates react will give an indication of whom they plan to represent at the next election. Unions and the Tories have made it clear that the older voter remains their focus. As the average age of voters surpasses 55 at the next election, that seems electorally sensible. Lib Dems may ditch the land value tax for fear of limiting their popularity with this group. Unions have a chance to escape their downward spiral if they embrace policies that appeal to younger workers, but at the moment they remain in the grip of shop stewards and leaders who feel compelled to do what their (largely older, public sector) paymasters want, which is to make sure they maintain as much of their promised standard of living as possible.